Output Current: 3A. 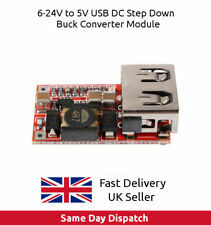 DC/DC Converter Module x 1. Output: 5V DC. 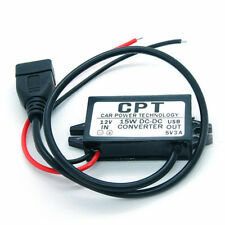 Input: 12V DC. When connected with one device the current is 3 Amp, when two devices are connected the current will be 1.5 Amp each. Kindly note that these USB Ports will not work with iPhone or Apple Devices for charging or data transfer. USB port power converter, convert power from USB port to 12V cigarette lighter socket. 1 USB port to 12 V car cigarette lighter socket converter. Cigarette lighter output: 12 V, 8 W. USB input: 5 V, 2 A.
Shower Curtain Rail. Output current: 5A. With 4 USB port, you can also connect four USB standard device simultaneously. Exercise Fitness & Health. Sports / Exercise & Fitness. USB socket provide standard 5 Volts directly. 2.1/5.5 DC to USB 12 Volt to 5V Converter. Can power a 12 Volt device from a 5V Power source. USB: USB 2.0 Standard Male. Features:100% Brand new and high quality All epoxy sealed containers with Waterproof Housing Light compact, convenient to use and transport Non-isolated,synchronous rectification High efficiency:>96% Reliable, low heat dissipation With overload/over-current /low voltage /over temperature protection, stable performance. Auto recovery Product properties:Input voltage:DC 12VOutput voltage:DC 5VOutput current:3AOutput power:15W Model: CPT-UL-6Specifications:Input voltage:DC 12VOutput voltage:DC 5V Output current:3A Output power:15W Efficiency: Brand Unbranded UPC Does not apply ISBN Does not apply MPN Does not apply SIZE Reguler EAN Does not apply SIZE Reguler EAN Does not apply. 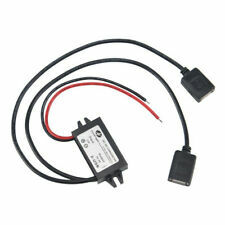 Input: 12V red line ( ) black line (-) Output: 5V standard USB interface. Output Volts: 5V DC. Input: 9V-26V DC. The item is not suit for Samsung phone. 3500+ SOLD !!! BEST QUALITY !!! Output Indicator: Red. Full load temperature: 30 Celsius. Load Regulation Output Current: 3 Amp Max. Output Ripple: 10mV. 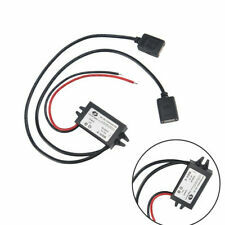 Dual Double 2 USB DC-DC Car Converter Module 12V To 5V 3A 15W Power Adapter. Output power: 15W Max. Output current: 3A Max. 1x USB Power Converter. Note: The red wire connects to the positive, the black wire connects to the negative. Cigarette Lighter Output: 12V, 8W. Convert power from USB port to 12V car cigarette lighter socket. USB Input: 5V, 2A. 1 x USB Port to 12V Car Cigarette Lighter Socket Converter. USB Port Power Converter.